One feature of Windows 7 which has really set tongues wagging is the new multi-touch capabilities, built into the operating system. Windows 7 supports a range of gestures and has the ability to deal with multiple points of contact which Microsoft hopes will lead to an experience akin to the excellent iPhone and iPod Touch. However, the success of Windows 7 as the first true touchscreen operating system hangs on the adoption of the technology by third-party developers. Since Windows 7 was released back at the end of October, a band of developers have released or announced apps that take advantage of touch. So as hardware manufacturers start to release touchscreen monitors and all-in-one PCs, we look at the forthcoming applications for those who want to get in touch with their PCs. The latest Digital Studio suite is now fully compatible with touch displays, so you can organise, edit, create and share photos all with the power of multi-touch - just swipe across the screen to scroll through a batch of images, to example. Fans of eBooks and Amazon's Kindle reader will be pleased as this free Kindle application enables you to read eBooks on your PC. Using touch, you can easily flick through the pages of your eBooks - and read them on a large screen too. The beta of Kindle for PC beta can be downloaded free of charge. Lagoon is impressive graphically, as the water ripples under each touch point of your hand, and reacts to every fingertip individually. 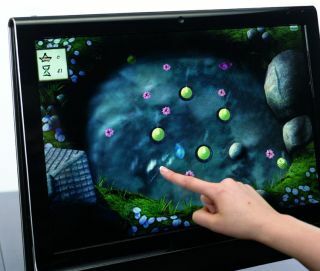 A good demonstration of multi-touch technology - even if it is ultimately a glorified screen saver. Before computers, art was a hands-on experience. And now it is again; you can draw and create pictures using your finger for brush strokes, or manipulate images in the same fashion. The usual range of photo viewing and resizing is here, plus you can upload and share slideshows with friends. You can also use fingertip gestures to create greetings cards, invitations or any medium using your favourite photos, music and videos to add a personal touch.